The Best Self Defense Baton Period! 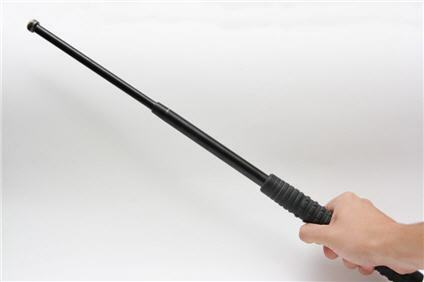 A self defense baton is a very effective weapon and deterrent. But there are all types of them on the market, and there even more different types of weapons you can use for self defense. It's confusing. But it all comes down to what you are most comfortable with during a particular time, event, or daily or nightly routine. For example, if you are going for a jog in the park, is a self defense baton ideal? Not likely, but it can be used when jogging. How about walking the dog, or taking a stroll on the beach? You don't want to be burdened with a baton during a relaxing time such as this, however, with the right holster it's fine. What about having one in the car, in your desk, or behind the counter at work? This might be a better use for it. Or, better yet, if you are on security duty, a self defense baton is one of three or four ideal choices to have at hand. The other choices in my opinion would be pepper spray and/or a stun gun. 26" overall, 9.7" handle 17.8 oz. This is a great baton for the price. You can hit a lot of different object with this baton and do significant damage while the baton stays solid in your hand. It's easy to collapse the baton you just point it to the ground and drop it about two feet to close it. With practice you'll be able to do this with ease. This should be done on non-breakable surfaces. The bottom cap on the baton features a Smith and Wesson logo and there's a rubber grip so you can take good controlled swings with it. The holster and sheath of the baton is of a high quality so the baton will fit well into a belt. You can adjust the height on the loop so it fits on your waist better. Another thing that's good about this quality self defense baton is you can fit a flashlight attachment on the baton. If you are looking for a good baton for personal protection, this one will work for you. This one is easy to open and by following the instructions it should close with ease too. Just remember that it's considered a weapon and not a toy so don't let just anyone use it. You can use it camping for personal protection or just have it handy in your home. The handle is made out of tight rubber and it feels good in your grip. This is a decent baton for beginners to these weapons. This baton also has a very attractive price. This self defense baton keychain has a pressure tip. 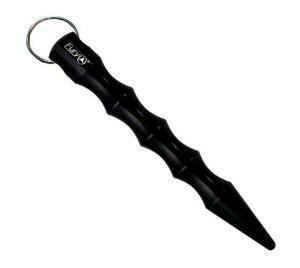 This is a very easy to use tool which is discrete for self defense. When you carry it in your hand an attacker is not likely to see the baton. It can be used as a stabbing weapon. You can keep this baton and your keys together. While this baton isn't very lethal you'll gather enough time to get away from your attacker. The baton is made out of lightweight materials and it's easy to carry and conceal. The hand-grip of this baton is solid. It's made out of smooth, black-anodized aluminum. This baton is 16" and big enough for most people. The baton has a good reasonable price even if you factor in shipping. The baton is easy to wield, easy to close and it has a solid feel to it. The baton is heavy and you can do good damage with it when it's needed. The baton won't slip as it has a good grip on it. The self defense baton is a bit difficult to close at first but with a bit of experience it isn't much trouble. This is a great self defense weapon that can be sued by just about anyone. Very durable baton when you use it against various objects.